The plot kicks into high gear when Irving and Sydney run afoul of FBI agent Richie DiMaso (Bradley Cooper), a hugely ambitious idiot who wants to use them to go after even bigger game. And to complicate matters further, Richie develops a bad case of the hots for Sydney — who seems to reciprocate although it’s probably yet another scam. “American Hustle” starts in the middle, then flashes back to the beginning and then forward to the end. And it’s narrated at various times by the three main characters. Both of these narrative flourishes have the effect of distancing us from the plot, a “Sting”-like affair that requires the audience to pay attention even as Russell and Co. are chucking diversions at us. Is this deliberate misdirection or just sloppy storytelling? Can’t tell, but the upshot was that as the yarn progressed I felt less involved rather than more. And part of the problem is that there’s not one character here with whom we can form an emotional attachment. Everybody’s using everyone else. Some filmmakers can get away with this…apparently Russell can’t. In fact the only character to engage our sympathy is Jeremy Renner’s mayor of Camden, N.J., a seemingly decent public servant (despite his retro pompadour hair style) targeted by the Feds as part of their Keystone Kops operation. As I said, though, there are things that work superbly here. Russell is surrounded by players he’s collaborated with before on “The Fighter” and “Silver Linings Playbook,” and they carefully walk the line between absurdist humor and a straight-faced realism. I was particularly taken by Lawrence’s ballsy, conniving trophy wife. The range exhibited by this young actress in her film career to date is astonishing. Can the Ozarks teen of “Winter’s Bone,” the surly action-heroine of “The Hunger Games,” the addled widow of “Silver Linings…” and the Jersey Shore-ish Roselyn all have been played by the same 23-year-old? Wow. And when Lawrence’s Rosalyn gets a bit tipsy and threatens to sink the whole sting by flirting with the entourage of a Miami mobster (Robert DeNiro), we’re seeing comic genius at work. The production design is pure late-70s kitsch — flambouyant, in screamingly bad taste, and practically a character in its own right. 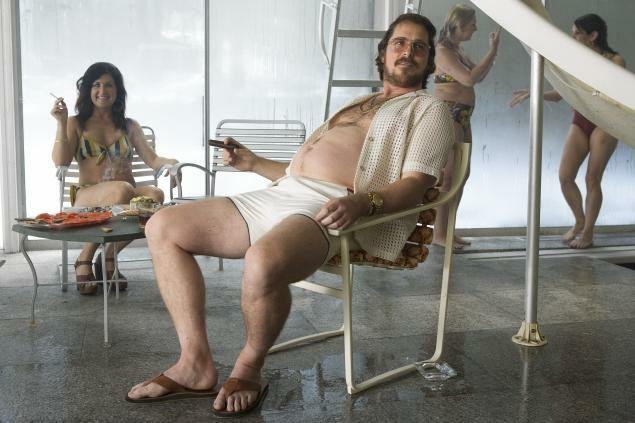 And yet… and yet…”American Hustle” lacks focus and discipline. I wanted to relate… and couldn’t. I’m definitely planning on seeing this one. I love Christian Bale. I’m honestly scared that he is going to die young with everything he does to his body (he lost something like 75 pounds to play in “The Machinist” right before packing on something like 50 pounds of muscle before “Batman Begins.” But, he’s definitely an awesome actor. Bob, I agree completely with your observations but think your grade is a tad generous. I would go more in the C- range only because with so much going for it, Bales & Lawrence, then to a lesser degree Adams, Cooper and Renner, there has to have been some serious mismanagement on the back end to not have a better movie. I lay it on the script writers and possibly the editing which can be crucial to good film comedy, especially dark comedy. And of course, with the director, Russell who I think got the performances he needed/wanted but couldn’t quite get them finessed into the final cut. Again, more would have been less. I think loosing 15 minutes would have tighten things up, moved the story along and probably helped the comedy. We saw it at a twilight show, nice audience about ¾ full and it was ready to laugh…but there was little to laugh at. I would say in the entire movie there were 5 maybe six real “laughs” from the audience and without the humor to engage us the story itself alienated us. My companion and I couldn’t wait for the movie to be over. It wasn’t that it was bad, but we didn’t care, just like you said. AS the movie went on I tried to find something, anything to hold my attention and I found the actress playing Mayor Carmine Polito’s (Jeremy Rener) wife, Dolly Polito, really grabbed me. Every time she came on the screen I couldn’t help but watch her. Her nail polish interactions with Lawrence had me giggling and when she later took charge of the dispute between Lawrence and Adams at the crucial political charity gambling event in the bar while Victor Tellegio was changing the game in the backroom, Dolly showed a natural strength of character that perfectly matched Carmine’s Mayor, she was the perfect politician’s wife. I kept waiting for her to come back on screen. Then the denouement at their home when the Polito world came crashing down. – I was riveted watching her. This was the fully fleshed out type of character, from funny to strength to meltdown, I had wanted in all the leads and that Bales and Lawrence came closest to. But who was the actress playing Dolly Polito? I had never seen her before? Except I had. I had watched her for years on Law & Order as Jack MCoy’s trusty DA Serena Southerlyn. The actress was an unrecognizable Elizabeth Röhm! You could have knocked me over with a limp legal brief. Her IMBd profile shows she works constantly, mostly in TV but this performance could be a career changer if anyone notices it. And I think within the movie there is a lesson to be learned. We saw just exactly the right amount of Dolly Polito for her to be funny, strong, to care about what happened to her and to be left with an indelible image. She wasn’t perfect as a person but I cared about her. The four/five leads – too much, too confusing, not funny, didn’t care. Ooops, “more would have been less.” Ment to say “less would have been more.” “Brevity is the soul of wit” and all that.